Foxconn, the wholly-owned subsidiary of Taiwan-based Hon Hai Precision (2317:TW), has begun deploying their own brand of industrial robots to their factory in Jincheng, Shanxi Province, China, according to various reports from China news sources. Shanxi Province is an area where Foxconn is partnering with local governments – spending $16 and $27 million respectively – to build factories and employ 200,000+ local workers. 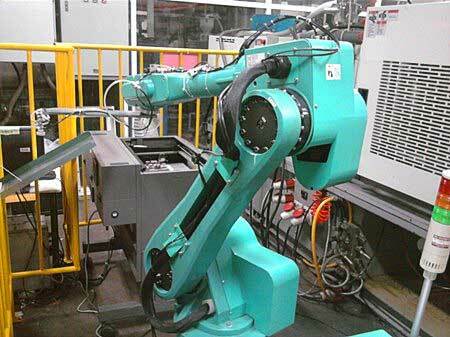 One of those new factories is earmarked to manufacture robots. Only can be engaged in some simple and repetitious tasks. Priced at $20,000 to $25,000. There are different versions. Some appear crab-like, others act as lifts, some as pick and place robots. All appear to be capable of precise movements. One article said that although some robots were already being deployed, progress is slow and that Foxconn will only deliver and install 1/10 of the 300,000 projected for the end of 2012. But there have also been recent news stories about a series of negative incidents similar to the ones 18 months ago that prompted Foxconn to announce plans to launch their own robot-making facility and their intention to deploy 1 million robots by 2014. Workers and security guards got into a tangle which shut one factory down for 24 hours. Chinese labor rights groups complained about underage vocational students being forced to work at Foxconn factories. After a 20 month hiatus, there was another suicide incident at one of the Foxconn plants. A couple of key Foxconn executives left the company. A hospitalized brain-injured worker was “ordered” by Foxconn to leave the hospital. In each of these instances, the truth is much less inflammatory than the headlines. Nevertheless, there appears to be a reoccurrence of instances of worker unrest and seemingly unfair labor practices, at least from a Western perspective. Chinese news sources say that Foxconn has a four-pronged program to alleviate their labor and growth problems, one of which involves the development and deployment of 1 million robots as quickly as possible. At present, Foxconn employs 1.2 million workers, 400,000 of which are directly involved with Apple projects. It should be mentioned that some of the incendiary headlines for these stories are attention grabbers because of Apple’s preeminent status, their successful iPhone and iPad products and their continued use of Foxconn as their principle contract manufacturer. Samsung, Sony, LG, Google and others are all competitive with Apple. Also in the news, Apple CEO Tim Cook visited China and a Foxconn plant this week on a visit to meet with the Mayor of Beijing about undisclosed issues. State media reported that China’s vice premier promised Cook the country would boost intellectual property protection. “To be more open to the outside is a condition for China to transform its economic development, expand domestic demands and conduct technological innovation,” the official Xinhua news agency cited Vice Premier Li Keqiang as saying. Apple has relationships with China Telecom and China Unicom to sell its iPhone, with the only other Chinese carrier, China Mobile (the country’s biggest operator), also looking to clinch a deal. All of these decisions and news items play a role in Foxconn’s decision to automate much of their Apple production and assembly activities. Some Apple products are designed at the outset for automatic assembly. But the frequency of product design updates and changes also plays a role, since frequent changes mean robots must be reprogrammed to meet the new needs.